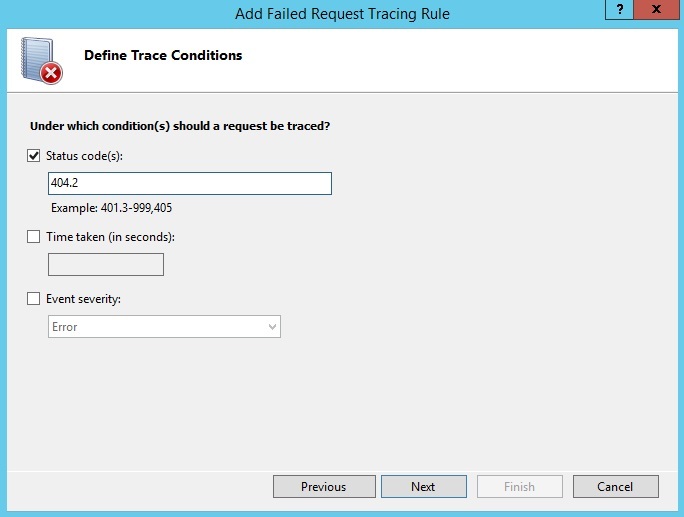 Request-based tracing is available both in stand-alone IIS Servers and on Windows Azure Web Sites (WAWS) and provides a way to determine what exactly is happening with your requests and why it is happening, provided that you can reproduce the problem that you are experiencing. Problems like poor performance on some requests, or authentication-related failures on other requests, or the server 500 error from ASP or ASP.NET can often be difficult to troubleshoot--unless you have captured the trace of the problem when it occurs. 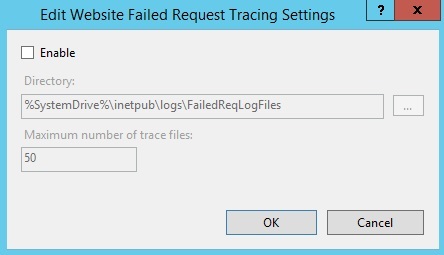 the following article discusses failed request tracing on IIS Server. 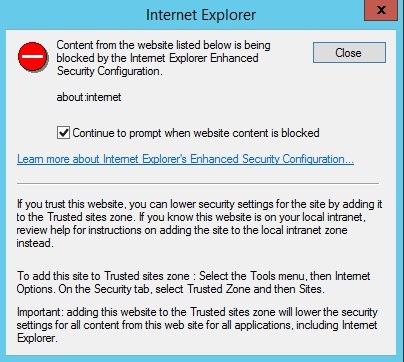 For information about doing this with Windows Azure Web Sites , click here. Failed-request tracing is designed to buffer the trace events for a request and only flush them to disk if the request "fails," where you provide the definition of "failure". If you want to know why your requests are returning a specific HTTP status code, e.g., 401 or 404, or if a request is taking a while to process or is not responding, then you can use failed request tracing. 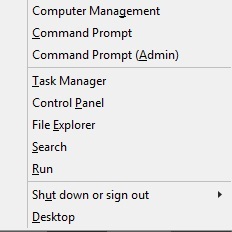 Click the Windows logo key and the X key simultaneously, click Command Prompt (Admin), and then click Yes. The above command creates a cleanInstall folder containing backup configuration files in %windir%\system32\inetsrv\backup. Open IIS Manager and select the server. 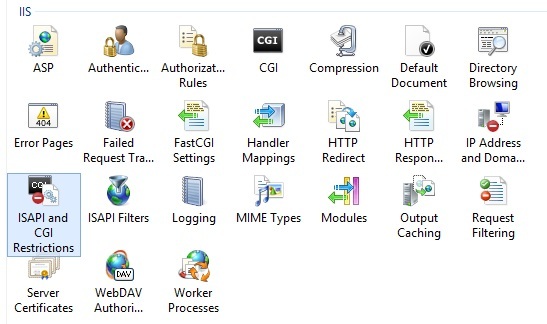 In the ISAPI and CGI Restrictions pane, select Active Server Pages. 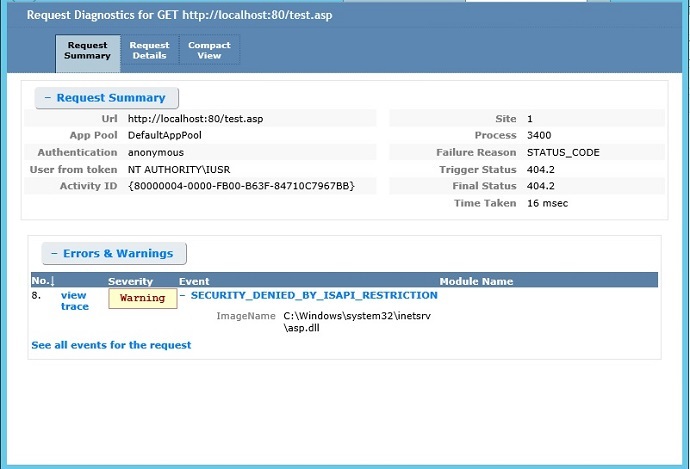 In the Actions pane, click Deny to disable ASP . Active Server Pages will show as "Not Allowed". Open a command prompt with administrator user rights, and navigate to %systemdrive%\windows\system32\inetsrv. In this step, you will configure the failure definitions for your URL, including what areas to trace. You will troubleshoot a 404.2 that is returned by IIS for any requests to extensions that have not yet been enabled. This will help you determine which particular extensions you will need to enable. For more information, see The HTTP status code in IIS 7.0, IIS 7.5, and IIS 8.0. On the Select Trace Providers page, under Providers, select the WWW Server check box and clear all other check boxes. Under Areas, select the Security check box and clear all other check boxes. The problem that you are generating causes a security error trace event to be thrown. 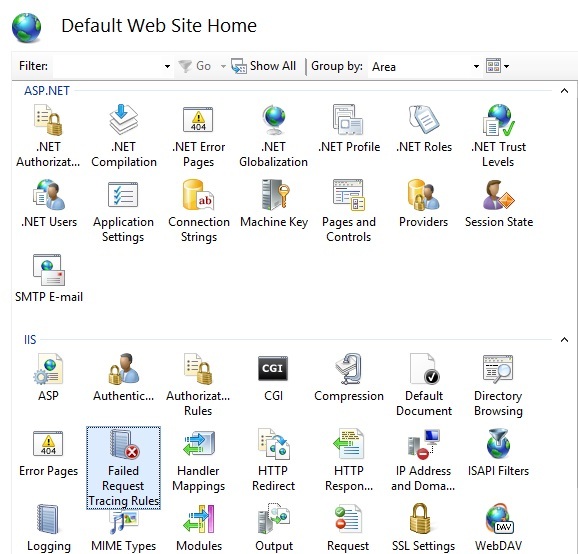 In general, authentication and authorization (including ISAPI restriction list issues) problems can be diagnosed by using the WWW Server – Security area configuration for tracing. However, because the FREB.xsl style sheet helps highlight errors and warnings, you can still use the default configuration to log all events in all areas and providers. When you install the Tracing role service, IIS installs the WWW Server, ASP, and ISAPI Extension trace providers by default. 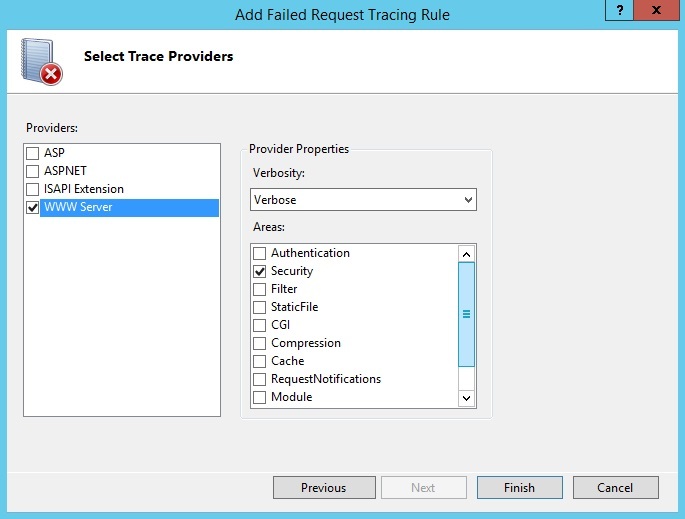 For more information on these providers, see IIS Providers and How to Create a Provider File for Request-Based Tracing. If you install ASP.NET 2.0 or above, IIS automatically adds the ASPNET trace provider. Additional providers are installed by the Application Request Routing (ARR) installer package, which also installs the URL Rewrite module, Web Farm Management, and External Cache. You can add more trace providers by using the <add> element within the <traceProviderDefinitions> element. Now that you have generated a failed request, open Windows Explorer and navigate to %systemdrive%\inetpub\logs\FailedReqLogFiles\W3SVC1. Open the raw XML file directly by using a text editor, and look at the contents of the event. 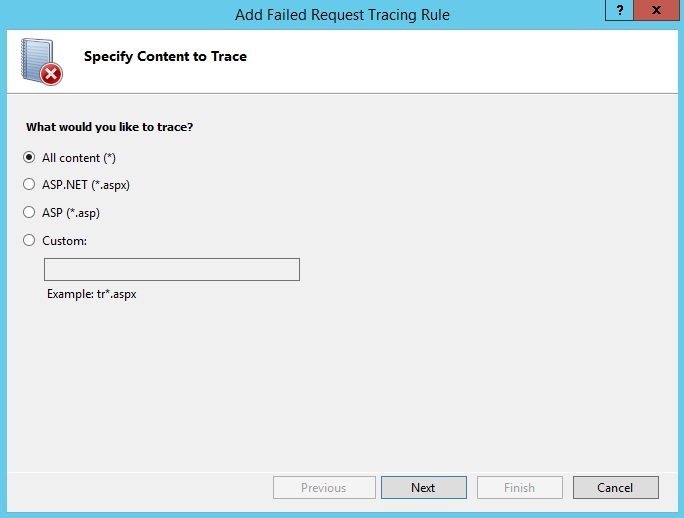 You have completed two tasks: configuring failed request tracing to capture traces for any request that IIS returns with a 404.2 status code; and verifying that IIS captured the trace for your request. You also verified that the freb*.xml log file did not contain any requests other than those with a 404.2 return code. When you consulted the failure log file, you determined that the cause of the failure was that the extension was disabled for that request. 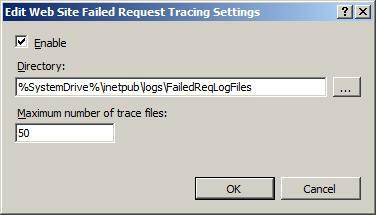 You can try other non-HTML pages (like gifs or jpgs) and note that the log file does NOT add these traces. You can also easily change this event to be 404, or capture the failure if the request takes longer than 30 seconds by setting the timeTaken field in your failureDefinitions.